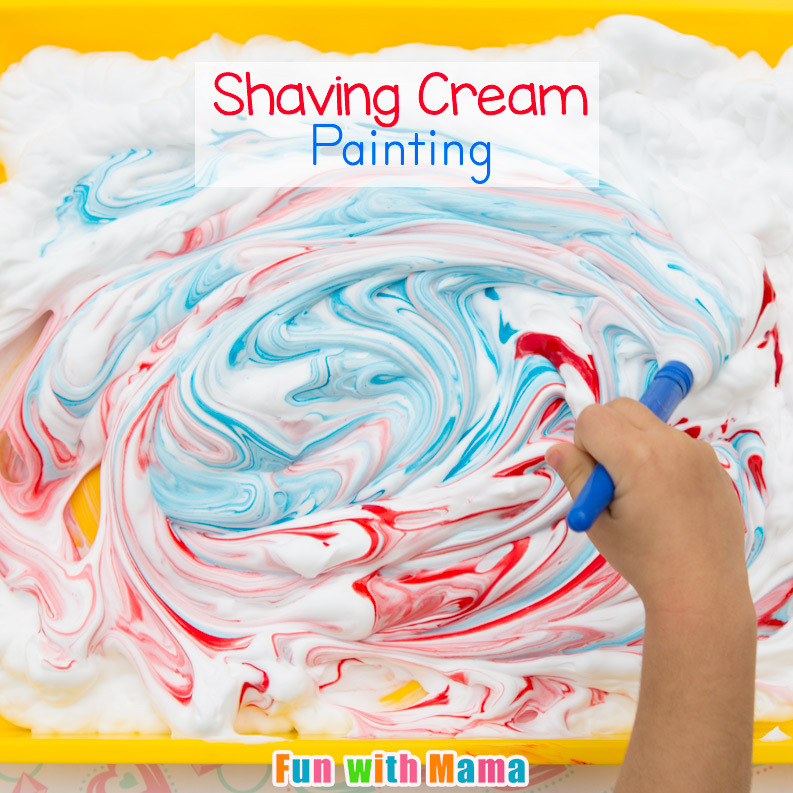 Shaving Cream Painting is a process art activity for preschoolers and toddlers. (My 7 year old loves it too.) 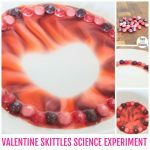 You need minimal supplies and I guarantee that your 2, 3, 4 or 5 year old child will have at least 30 minutes of sensory fun. Process art activities are more about the painting part of the process rather than the finished result. This is one activity my three year old wishes she can do over and over again. 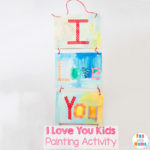 My kids love shaving cream painting as you can see from the last time we did it here. 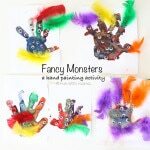 There are so many benefits to finger painting and process art activities. I know you might look at this activity and stress out about how messy it looks like it could potentially be. Begin with the end in mind. I show you in this video on Facebook how I minimize the clean up after. You can find the video in the first comment on the post. It is really easy and as you can see I had very little clean up. We have done Puffy Paint activities, colored ice painting, and even raised salt painting all with minimal clean up. A tray to contain the paint. You could also use a baking tray. Optional: Add in a few more items to hide in the shaving cream like foam shapes, little figurines, etc. You can also had a paint brush to mix the paint. Set it up by filling the tray with shaving cream. Then add a few drops of paint. I chose to go with a Valentine’s Day theme of hearts. 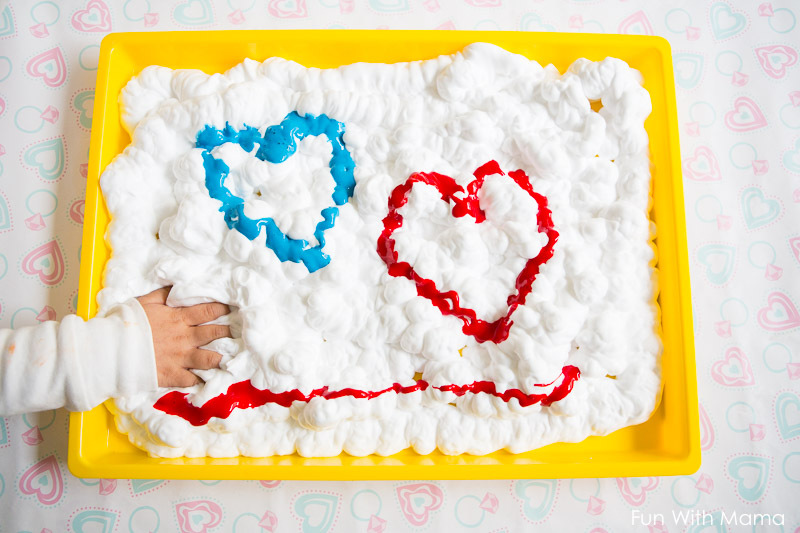 I also hid a few foam hearts inside the shaving cream to hopefully have her explore the shaving cream more. Now let your child explore the activity. My daughter mixed around the paint using a paint brush. She was very eager to put her hands in there. She had this look of anticipation on her face as she was trying to do the activity the way she thought I want her to do it rather than the way SHE wanted to do it… I remind her that this activity is for her. She can do with it whatever she pleases. At this stage I would take a piece of card stock paper and place it gently over the shaving cream. Then turn it over and place that piece of paper on your table. 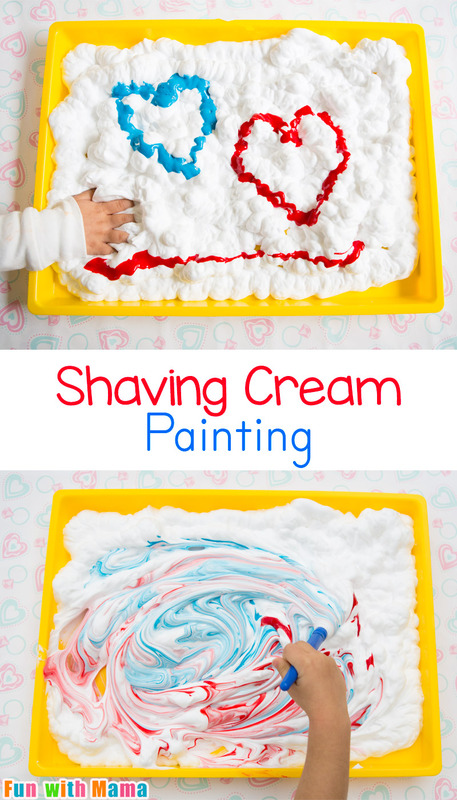 Use a card something similar to scrape off the excess shaving cream. You can keep this as your final product. My three year old daughter did not do this. She was more interested in putting her hands in the shaving cream. She searched for the foam hearts…. … and happily found them! We are definitely going to revisit this activity a few more times. Next time hopefully we can get some pictures. 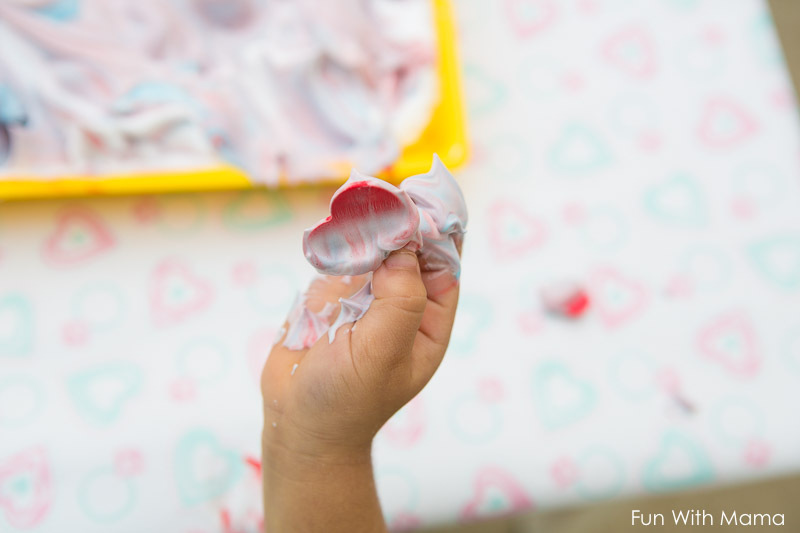 Did you know that you can make slime with shaving cream? 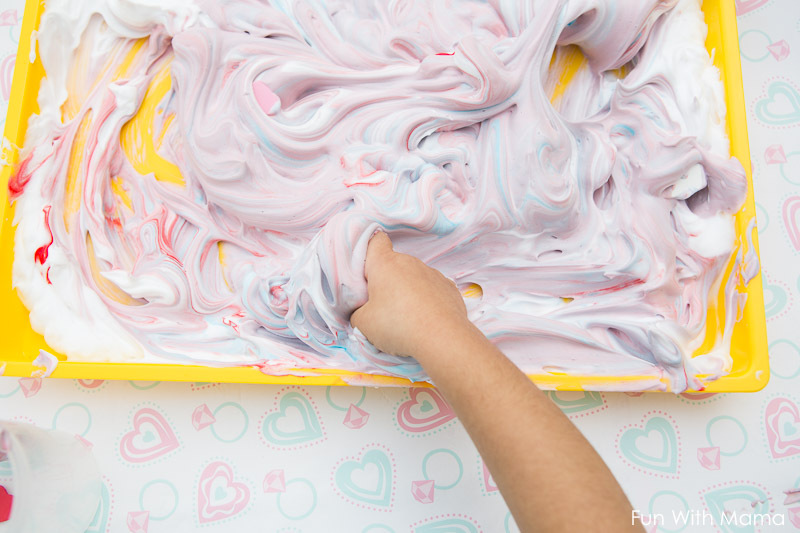 Check out this how to make fluffy slime post. Raised Salt Painting — One of the best process art activities ever! 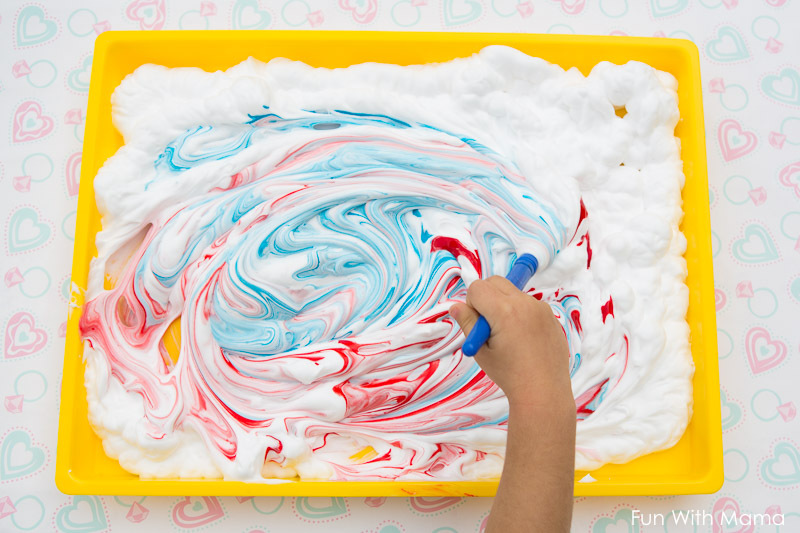 You can make marbled paper with shaving cream too.